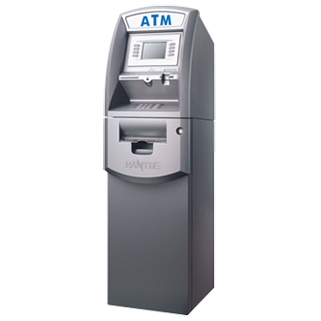 The Hantle 1700 Series ATM represents an unsurpassed value in retail ATMs. With its modern, elegant design, matched with the reliability, security and durability you expect, the 1700 Series offers the best value in its class. While targeted for lower transaction volume retail markets, the 1700 still contains all the important features you expect including; TDES and ADA compliance, VISA certified encrypting PIN pad (EPP), a voice guidance system, LED action indicators including keypad light for dark location. Additionally, the 1700 comes standard with other quality features including the choice of a 5.7 inch Monochrome or Color LCD panel (custom ad screens can be loaded), 56K modem, and an integrated lighted topper. Weighing in over 200 lbs, the solid construction of the 1700 (UL291 Business Hour) provides a secure vault while offering a modular construction for ease of access and maintenance.